The Fellowes Powershred 225i is a strip-cut office shredder which will shred up to 20 sheets of 75gsm paper at a time. It shreds paper into 5.8mm strips and has a P-2 security rating, meaning it is suitable for the shredding of everyday (rather than confidential) documents. The shredder is recommended for 5+ office users. The Fellowes 225i shreds credit cards and CDs, as well as staples and paper clips too - so it is a good choice if you need to shred a variety of different media types. 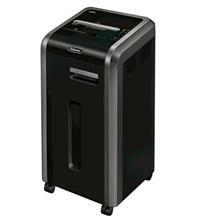 The shredder has a 60 litre waste bin and is compatible with Fellowes waste bags, product code 36054. Other features include: an Energy Saving System which switches the shredder to standby after 2 minutes of non-use; a 100% Jam Proof System which eliminates paper jams and powers through tough jobs; SafeSense technology which stops the shredder immediately if hands touch the paper entry; and SilentShred to reduce noise disruption in the office.